Early map showing landholders throughout the Cape. Nieuwe Kaart van Caap der Goede Hoop in hare rechte jegenwoordige staaat vertoond door Francois Valentyn. A beautiful and remarkable 1726 map of the Cape of Good Hope, South Africa, by Francois Valentijn. This map actually comprises of two important maps on a single sheet. The primary map details the Cape of Good Hope from the Doornbosch River to the Baay van Algoa (Algoa Bay). 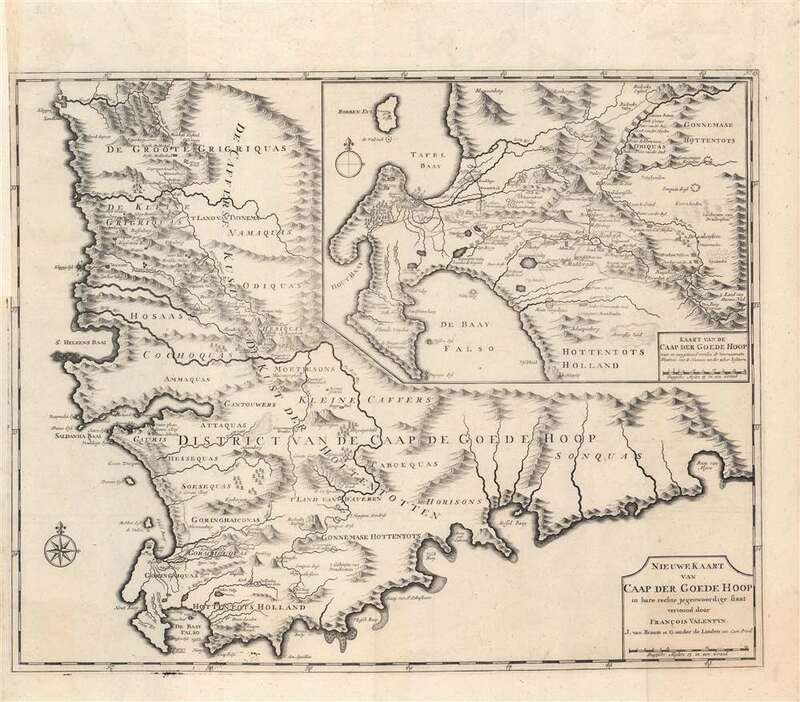 The second map, appearing in the upper right quadrant offers a closer detail of the modern day Cape Town region from Robben Island to False Bay and east as far as Draakenstein. Both maps offer exceptional inland detail with landholders noted throughout - an exceptionally valuable resource for anyone studying the early development of the Cape. Being one of the earliest sophisticated maps of the region, Valentijn's chart was used as a model by numerous subsequent cartographers. This map was issued in Amsterdam in Francois Valentijn's 1726 Oud en nieuw Oost-Indien. It was published by Joannes van Braam and Gerard onder de Linden, whose names appear on the imprint. Today this important map is very scarce. Francois Valentijn (April 17, 1666 - August 6, 1727) was a Dutch minister, naturalist, colonial administrator, and historian active in Holland and the East Indies, in the late 17th and early 18th centuries. Valentijn was born in Dordrecht, Holland and studied at the Universities and Leiden and Utrecht before, in 1685, taking a position with the Dutch East India Company (VOC). He remained in the East Indies for about 10 years before returning to Dordrecht. Unable to adjust to life in Europe, he returned to the East Indies in 1705 where he remained for another 9 years. After 19 total years in the Orient working for the VOC, Valentijn once again returned to Holland where he composed his eight volume five part masterwork Oud en Nieuw Oost-Indien. The scope and detail of this work, including over 1000 engraved images and numerous maps was unprecedented with regards to Asia. The work contained some of the finest and most detailed large scale maps of the East Indies ever published. The most important of these focus on Taiwan and Malaya. Valentijn most likely drew on secret VOC manuscript maps and documents, a fact that makes it exceptionally surprising that his works were actually published. Valentijn academic scholarship, in sharp contrast to his cartographic work, is often highly criticized as being self-aggrandizing and, more often than not, plagiarized. Valentijn, F., Oud en Nieuw Oost-Indien,( Dordrecht: J. van Braam) 1726. Very good. Crisp dark impression suggestive of an early strike off the plate. Original platemark visible. Left margin expertly extended where originally joined to volume. Blank on verso. Library of Congress, Map Division, G8503.C3 1726 .V3. OCLC: 871359935. Norwich, O. I., Norwich's Maps of Africa: An Illustrated and Annotated Cartobibliography, no 214.